"This is one of the most homespun, comforting, pleasurable, heart-felt, unfeigned, deep-rooted traditional albums I’ve EVER had the pleasure of listening to. Listening to this is like a hug, like rocking on the porch, like your mother’s love—all rolled up into 20 beautiful tracks that will take you back—even if you’ve never been there. This piece of work is one that most of us can only wish we had done ourselves." 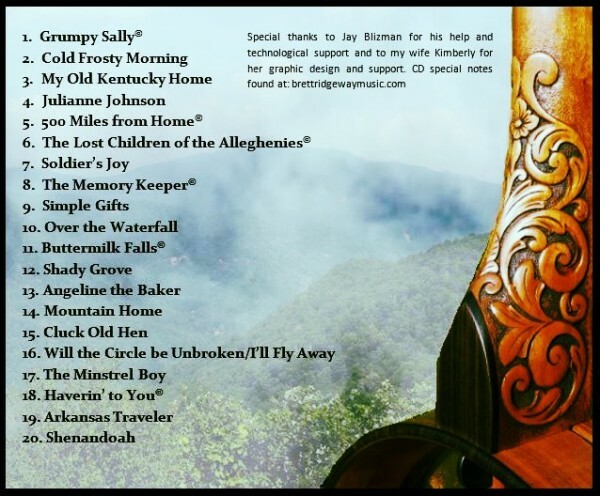 Brett's first all-banjo CD featuring 20 songs covering the many voices of the all American banjo!